Good morning! How are you today? I am back with Part 3 of my One Sheet Wonder using the Birthday Boutique Designer Paper in the Occasions Catalog! Sorry for the break, but I hope you enjoyed the Valentine Blog Hop and the GDP challenge card. First up, a pocket card! I love pocket cards – they are a bit different and also allows you to hide something inside. The DSP rectangle is cut diagonally and one triangle flipped over so that you once again get to see both sides of the paper. I decided to form a pocket with the two triangles and to place my sentiment inside the pocket. 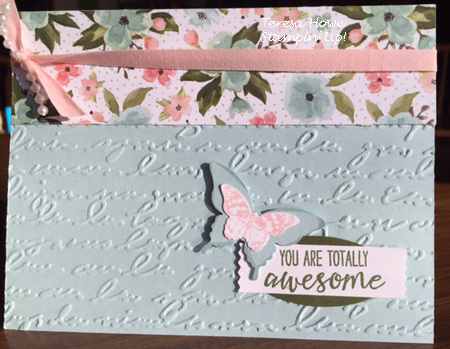 The card still opens up as well, so you can write your message on the inside. 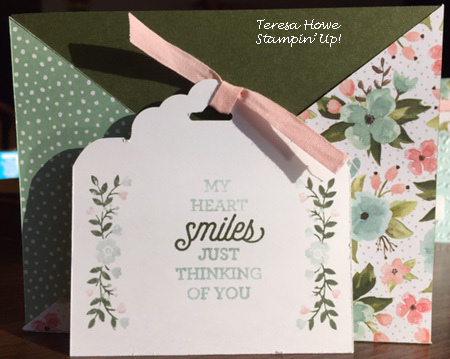 The sentiment is from Suite Sayings while the border is a stamp from the Bloomin’ Love stamp set. I used markers to color the stamp directly. Next up, this quilted panel card. For this one, you cut four 1 1/4″ squares diagonally, flipping over half of each one, to create the four points. I have a 5th square under the butterfly. I thought the foil doily was a nice touch for this card. The sentiment is from A Dozen Thoughts. Last card for today. Just a plain strip of the Designer Paper this time. I opted to emboss my base card stock (this is a retired embossing folder), before attaching my DSP strip. I opted to use punches to layer my sentiment to make it pop just a bit. 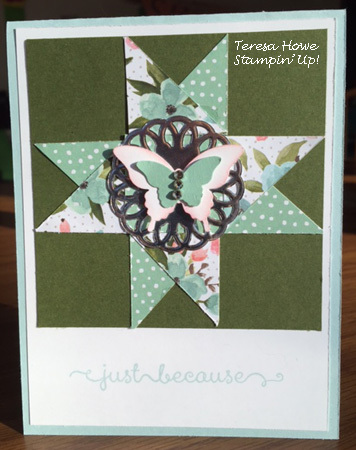 I also stamped the butterfly from the Grateful Bunch stamp set and punched him out to give my layered butterfly a different look. A little ribbon to finish it off. So, what do you think of the cards so far? I have three more to finish and I will share the 12×12 cutting template that I used as well. I will also include a picture of all twelve cards according to the cut picture so you can see what pieces in the cut map go on each card. Would love to hear your thoughts and if you would try this!